I was thinking dark and bright and a little bit curiosity-vintage (not sure if that's an actual term but I like it ;) You know a bit Alice-in-Wonderland combined with a Strange Study? Kind of quirky but still fun with some bright colors? My reasoning went a bit like this: My frst son is very sweet, but really rough-n'-tumble like most little boys. I wanted to create a space that feels a little more "boy" than "baby" because they become little guys so quickly. The "baby" stage is so short-lived. I wanted to fill it with interesting things we've collected over the years... Things we can talk about... With artwork that sparks questions & the imagination... With meaningful pieces. So, I'm aware that this nursery doesn't scream "baby" but it was a conscious departure for me. Here's what we started out with when we moved in: The furniture, white walls, and the seashell mobile left over from Christian's old nursery. I'm a big fan of combination dresser-changing stations in babies' rooms and I like to get them in the closet if possible to maximize floorspace for play. We ended up taking the bi-fold doors off of Justin's closet because when open, the left door got in the way of the actual bedroom door. I plan on adding curtains to the opening eventually but haven't gotten there yet. (I also know the curtains would pretty much always be open right now because we're in a fly-by-the-seat-of-our-pants kind of stage and have little time for extra steps.) We mounted a cheesy winnie-the-pooh mobile above the changing station, but that thing is a lifesaver & I must admit, I love the song ;) We keep extra blankets and burpcloths in the baskets and diaper stuff in the top drawer. There's hanging space for clothes on the left and I didn't take pics of the left side of the closet because it's not "organized" yet -- i.e. it's a mess! ...So we cut it down and now use only 4 baskets instead of 6. (The other 2 are now in the closet holding the blankets) I made the blanket hanging on the crib out of some curtains I found at Goodwill that I backed in fleece and finished off with a fun fringe. Here's the cut-down shelf. Since I'm always moving stuff around, who knows what will stay and go on the top shelf (and once Justin can pull himself up in the crib I'll have to ditch the breakables)... But for now, I used a pitcher full of branches from that magic bush on the side of my house (they'll root in water) along with the scale I recently found at a thrift shop. Christian loves playing with the stones we placed in it. I adore these barnwood paintings by my Grandmother below. My Grandmother is one of the most creative and focused people I know. She made these so long ago but I just love them. ...So that's pretty much each & every item in the room! I'm really excited about going a bit outside of my comfort zone with this space. I had so much fun putting it together & love that I can just keep adding to it. It's a really sunny bedroom so I'm loving the dark walls which dim it down a bit for midday naps. I feel so cozy and comfortable in the nook where the chaise is and I just love curling up there with my llittle guys (and dog too!). Thanks so much for reading and hope you enjoyed! A beautiful space! You are so smart to create a place of curiousity and something Justin will be able to grow into. It is nice to hear we are not the only family who seems to spend most of their time in the smallest room in the house! I love your unique style, Lauren! I really like the paint color and chaise and cuckoo clock and....everything else! It looks divine. Really full of personality and so interesting. I am sure your baby loves that canopy because it is black and white - you probably know that babies love B&W contrasts. You are AMAZING!! I love this nursery and I am amazed at your energy to DIY!!! My jaw hit the floor from the first sight of the navy walls- I thought you could not surprise me with anything crazy but you just floored me for sure!! Love love love this, just like i love everything you put your hands to :) You have two VERY lucky little boys who have the coolest rooms ever!! It's perfect. So eclectic, which I adore! The vintage styling is so well put together. The wall colour and the stenciled "canopy" are fabulous Lauren! I love the vibe you've created in this nursery, and LOVE that it's not a typical, babyish nursery. Good job Mama! PS. My "baby" is now 14 months and I'm just getting around to her room, so don't you feel bad one bit! Eclectic and personal! Hooray on a very unique and cool nursery. Love the canopy! I could not help but to think back to your post 'an exercise in undesigned spaces...'. this nursery is the perfect example of what you were trying to convey there. stunning. everything. the room color, canopy, collected art -everything is so personal and lovingly placed. thank you so much for sharing your talents. I love it Lauren! lucky Justin. I too am amazed you did it yourself with a three month old and a toddler! hope you are getting plenty of sleep. I love this space! It came out perfectly! What a unique space! I really love the artwork and I'm sure both your little boys will love staring at it for a long time. The canopy was a great idea too and looks amazing with those navy walls! I love absolutely everything about this space, especially the painted dropcloth. Everything you've done (both in this post and others) is so inspiring!! In fact, a few of my girlfriends and I are headed to Leesburg this weekend to check out some of the shops you've mentioned in the past. Here's hoping we find things even half as great as what you've got going on this room! What a dramatic change! I love it :) Seems so personal and beautiful! Great job!!!! Beautiful room Lauren. I can't believe that's just a dropcloth that you stencilled - it looks like very expensive fabric. Great job! I think that has got to be the most sophisticated but still fun nursery I've ever seen. I especially love the chaise in the room and the handmade canopy. It's all glorious. It's totally a room I'd have in my house. My mom had 4 of those pendant lights in our house growing up. I always liked them. And the owls - I'm sucker for them! You're welcome to come on over and see my thrift store owls. Your thinking outside the box is brilliant. I love the space. The wall color is beautiful and I love the forest animal print and all the extra color and texture in the linens and pillow. I think more moms should wait until after the baby is born to do the rooms. Wow!!! Very cool room! Love it! Im going to be finishing up my daughters room soon and she is 1.5! This is just the cutest nursery. Just beautiful Lauren. So fun to have little ones. They grow up so fast. I can't believe how time flies. Just a lovely space to enjoy every day. Love your blog. Will be back very soon. This is fantastic. Such a lovely room. I wish my little studio looked anything like this (though a bed for me rather than a crib would of course be ace.) Also, I think it's super sweet that you made a little nook for Christian. You are so amazing! I totally love it!! And I love your blog. Have a nice day!! This is straight out of a magazine! This room is spectacular. I love every little detail and can see that this room will be loved for many years to come. Bravo to you! I love it. I love all the pictures. Your nursery looks like a nursery that would be featured in the Domino Magazine (I miss that magazine so mcuh) You are very talented! I agree that chaise corner is a Domino page for sure!! It looks so wonderful lauren and you are right the baby phase goes so quickly. Enjoy your new space. What a beautiful nursery! Love all the owls in the room and that canopy is fabulous! hoot hoot, you are one wise owl! I wonder if you stay up all night because I am impressed by all you do! I really love the mix, and deep down secretly wishing it were my crib. I love that it is not all sweet or sporty. Perhaps your little hooter will aspire to work as conservationist, a vet, or a cuckoo clock maker. Love it...from the midnight blue to the handmade dropcloth! Spectac! This is such a beautiful nursery! I love how unique it is, making it a great space for the family, as well as little Justin (He is so cute!). If you want seagrass but can't afford it, Lowe's has a faux sisal that's indoor/outdoor (perfect for kids!) that my friend just put in his shop. It looks so great I ordered it for our 3rd floor. And it's only 86 cents/ft! The room is so unique and fabulous!! Love it all. The canopy that you stenciled is just amazing. What a wonderful nursery with tons of personality!! Love it all!! Great job, Lauren! I always thought if I have a little boy I would like to use navy blue. The room looks gorgeous and the canopy is very creative! I can't tell how great this is to see after having hearing your descriptions and thoughts. It is such a unique and delightful design!!! When I come visit, I have every intention of laying on the chaise and admiring all the artwork and curiousities on the wall! The hanging crystal pendants I think may have belonged to my parents and were once hanging up in my living room!!! And, the the picture of the black forest and woodland animals from our thrifting day is so perfect! It's as though it has been waiting it's whole life to live here in this room...it is amazing...worth every cent! You have an amazing style. What a wonderful room for a young man to grow up in. What a great room, it will grow with him. My favorite part is the canopy and the reading nook and all the special, sentimental art ! I am so happy to finally be able to see the nursery! It is the most sophisticated nursery and the "coolest" one I have ever seen! You just blew me away with your choices and creativity! I could move in there! Your children are so lucky to have you! 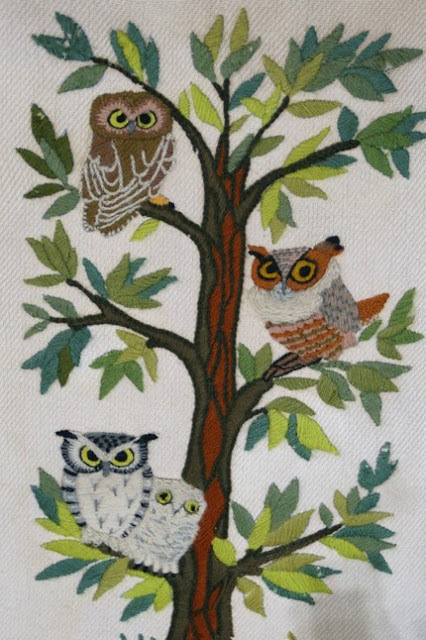 I love all the animal and owl motifs. I think this room may be better than my master bedroom! LOL! So excited that you are meeting Maria. You will love her. Shes super fun and high energy! Get your rest! She is the energizer bunny. Love it! What an amazing nursery. I love that it is sophisticated v baby but yet still so fitting for the baby. You did an amazing job. I die. Best nursery ever. I love how you created SUCH a unique space - I hope I'm that brave when I have a little one! I think the result is beautiful and intriguing, and it's no wonder your whole family likes to hang out in there. :) I think the canopy is my favorite part - such a great departure from staring at a white ceiling! Lauren- it looks great. I'm almost finished with baby c's nursery... or at least I think I am! I'm ready to wrap this project up! Wow. Insanely cool. Inspiring. You rock! I am always amazed at what people do with the drop cloths!! I like what you have done and I am sure your baby must love the stencil contrasting with the solid color--great idea for baby!! Love your lounge chair and area--great idea with all the pics . Plus your little reading area for your older son is so homey looking!! I agree with using closet space as you have done....we did that for a time only with a desk. Eventually we needed the closet back since I live in a 40's era house that has mostly very tiny closets! I was surprised at the color for your nursery!! But it works, doesn't it!! Very creative and it looks like a calm area. Also love the owl mobile. You have many fab ideas! what a lovely nursery. I popped over from My sweet Savannah. 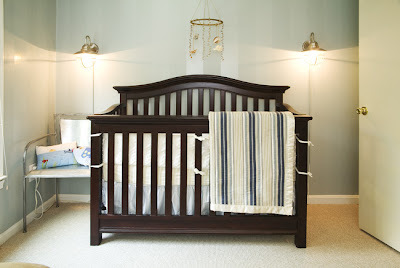 I like the fact you didnn't do a traditional it all has to be cutesy and matchy matcy nursery. I especially love the navy blue on the wall and that fabulous canopy you made. So , So lovely. What a beautiful room for a beautiful little boy. It is such a cosy space for the entire family. I have read your blog for some time and I really love and admire that fact that you design spaces for real people. Do not get me wrong I love and appreciate beautiful and expensive rooms that I see magazines. But I love the fact that that you mix and match less expensive pieces with some that cost a little more and budget to purchase something( and you say that you do), and you thrift and still have a unique and beautiful home! One thing that did concern me, the chains from the clock, do they hang too far down that a little one could pull on them and pull the clock down? Or get tangled in them? I would hate for something to happen to your adaorable little ones. wow! That is all I can say. I love the chaise corner... so cozy. You nailed your theme! We're hoping for another little bundle, and I've already been dydreaming about how I can work all kinds of vintage-y memories from my own childhood (and my husband's). Your grandma's wood paintings are exactly the kind of thing that I love to have around, but they just have a hard time "fitting in" - but no so in this nursery! :) Love it! All of it! I have the same ticking crib sheets, by the way, from when my now 3yo boy was an infant :) I'm guessing those are from your older boy's crib days. Very cute, Lauren!! It definitely has the "Pure Style" stamp on it. Most of your readers have already said exactly what I was thinking while reading your post. I love this room as much as your firstborn's room! I love how neither of the rooms look too charactery or like a page from Pottery Barn or too baby or that is screams boy! A few people could not be more right when they said this room warrants a shot in Domino if Domino was still with us! I guess why I like the room the best is because it has your distinct style (which is awesome) all over it! I love owls and I love how you didn't make the room look to trendy, it's classic! Again soooo awesome!! Lauren! You did such a good job! I have to know where you got the deer cuckoo clock! A one of a kind space. It's lovely and so great that it doesn't look like it's straight out of a catalog. Lauren, I am thrilled with this room and how amazingly talented and creative you are. I love that it is done and styled but also that it has a wonderfully relaxed vintage feel that is not too fussy, very relaxed style. You are so gifted. I love everything and hope Justin has wonderful sleeps and dreams and learning and fun in there. Love the reading nook, haha, and the shot looking up at the mobile. So funny...love the little owls. Great work and that canopy is amazing...! Looks like a very Domino mod space - too bad they are not still around to feature this room - I can see them loving it. So whimsical and fun. The chaise lounge I'm sure is used ALL the time for naps and middle of the night feedings, etc. You really do think of everything and it seems that it comes so incredibly naturally to you. Those boys are lucky to have you as a mom making things so comfortable and functional for them! So jealous! My "baby" is almost 1 and I still don't have his room the way I like it. Absolutely beautiful! In my next life I want to be your child! I love how personal you have made Justin's room. The color on the walls is perfect. It says "boy" without being baby-ish, for sure! I wish I would have thought of putting a chaise in one of my children's rooms when they were babies. That would have been so much more comfortable than a rocker. What a lucky little baby he is!! 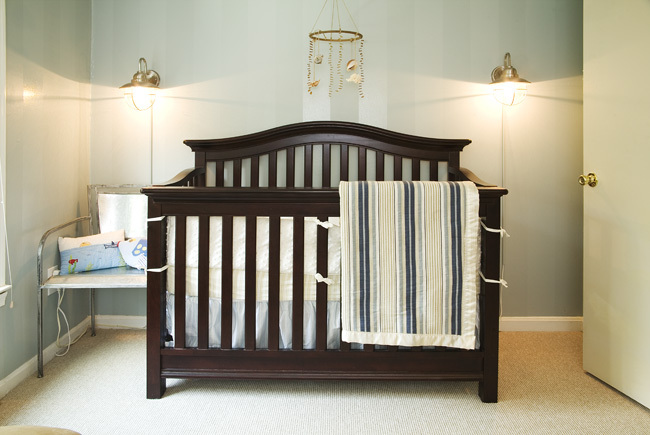 Such a sweet, yet super cool nursery with lots of original touches. First off that color blackish blue is my newest favorite color. And even Christian gets his own little reading nook. I completely understand how all of you want to spend time in there!! lauren! I love it. You did a fantastic job. I especially love the little reading corner for you older son. What a cutie! Absolutely lovely! It is just so sweet how you have made a special space for your older son and a sofa for the whole family. I think I would be hanging out there as well...it is just so inviting! I just went to Josephs Coat today and was happy to see how close it is to my home...I'll have to visit more :). Love the nursery hun! LOVE LOVE LOVE it! Curiosity vintage is the perfect way to describe this special space you created for your sweet boy! Okay, I know I already commented once, but it was this morning w/my hungry boys calling for breakfast. I just came back to feast over the details and had to say--this makeover is probably my favorite in a long, long time. I love it for so many reasons--it actually made me realize I love things I didn't know I loved! You are so incredibly talented, Lauren! And to think to did this all on a budget is even cooler. I wish you were closer so I could hire/meet you. Seriously, you are the bomb. Well done! I love the dramatic dark walls and pops of your favorite color green! I can't wait to share it with my readers soon! Love what you did in the nursery. What color blue is that? Gorgeous! Please come over to my blog...I have a giveaway that would be a great summer diaper bag. Happy to see a boys' or boy's room that is nice without the usual PB type football lamp, or skateboard on the wall, or syndicated characters(little boys or girls). My kids occasionally come home with comments like "joe has wallpaper with the jets" and I say you can forget that, you stuck with your art and antiques! And now they like it. Thanks for the nice post. Like the bold colors. Good for babies! Absolutely gorgeous! I love the chaise area, what a great spot for the family to hang out together! love it, love it, love it!! it is gorgeous!! I love how it is THE hangout spot for your family, and that the room accomodates that from the chaise to Christian's little nook. This is gorgeous! You are one talented lady!! Have a wonderful weekend! Love all the art, such lucky boy! There are some really cool pieces there, like the canopy & the clock. Christian's reading nook looks unbelievably cozy too. It definitely doesn't look like the typical baby's room & that's what is really cool about it. I think this is the coolest boys room I have ever seen! Thank you for the tour, all the details are perfect. Beautiful job... with crying baby and all. I'd love to know what color paint you used? It looks like exactly what I've been looking for. Such a great place for your family to nest. So much to love! My favorite is the stenciled drop cloth....I have always wanted to stencil fabric. you have gotten my wheels turning. its really lovely and attractive nice to see this blog. its good. I'm amazed by your creativity. I would never have known that the canopy fabric was a drop cloth.Fantastic, cost saving idea. I might have to steal your idea of making a blanket out of a curtain and fleece. Another creative idea. The room is just gorgeous! Lucky little baby. you have made a nursery look sophisticated AND fun! i love it. the art is fab. Just saw this (how did I miss it before?) Amazing, Lauren as always!! OMG! How unbeLIEVEably amazing, Lauren! It's gorgeous! Lauren-- you BEAST! I knew it was going to be fabulous b/c you're fabulous, but man, you knocked this one out of the park. I love it! Congrats!!!! Woman, you're a genius. I love i! Absolutely stunning! So unique and so perfect at the same time. LOVE! ok i'm in love with how you arranged all the artwork!! and the snuggle nook?? precious!! great job lady! i love this room! i saw it on design sponge and clicked over to see a closer-up picture of the throw blanket - SO surprised to see you made it from a goodwill find! very jealous. great job! I guess this will be comment no. 101!!! I just saw this on DesingSponge. Lauren, I am speechless. What an amazing transformation. Going from standard to chic European (hope you don't mind but I am from Europe myself!) with a personal touch. And the fact that you not only put up the fabric yourself - you even stenciled it - is beyond me! Wow! I love it! This is my dream nursery! I'm so inspired. Lauren what a wonderful space - WELL DONE! Can you tell us what midnight blue color you used for the walls And what is your favorite white to use. Thanks so much - Love your style. just getting to this... not sure how I missed it! In any case, I love what you have done here. The dark walls are dramatic. The picture frames fun. The canopy whimsical. So unexpcted for a nursery - love it! How on EARTH did I miss this?!? It's incredible, really, Lauren. I am looking for a similar fabric or pattern and thought to stamp/stencil myself and posted about it today. Everyone kept talking about your nursery in the comments! I can see why! WOW!! Great job!! What is the name of the paint/color on the walls?? You just did a great job! You are so creative when it comes to this stuff. I love what you did with your little boy's room - it's giving me all sorts of inspiration for my little apartment! What paint color did you use? I've been looking at a lot of different brands and can't seem to find anything that's quite as dark. I am with Elise - what paint color did you use? I would love to find something just like that but am having a hard time pinpointing that shade of color. Yemek Tarifleri Thanks for this post – I have struggled with this as I have NO comments yet on my blog and in some ways feel badly about that (until i read your posts about this) and yet I see there is more that I can do. thankss.